Chancellor Angela Merkel has tried to reassure Germans that the country can integrate the many refugees putting local authorities under pressure. "There are very, very many, but there are 80 million of us," she told residents of Nuremberg, Bavaria. "We can and will manage this integration." She urged Germans to get to know the newcomers "as much as possible". In Freiberg, eastern Germany, several hundred demonstrators tried to block buses carrying migrants late on Sunday. Police managed to clear the crowd away, but there were scuffles and firecrackers were thrown at the convoy, which was carrying about 700 migrants, Germany's ARD TV reported. Meanwhile, the authorities in Passau - a major Bavarian transit hub for asylum seekers - said they had been overwhelmed by a new influx of some 15,000 people who arrived from Austria at the weekend. Several hundred spent a night out in the cold on the Austrian side of the border before reaching Germany, as the Austrian authorities said they had run out of beds for them. 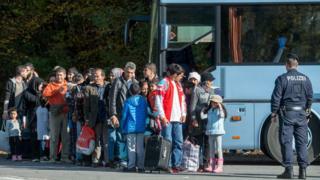 Passau has now urged Berlin to send extra federal police and soldiers to help look after the migrants. Many of them are refugees from the conflicts in Syria, Iraq and Afghanistan. Germany expects at least 800,000 asylum seekers this year - some estimates put it as high as 1.5 million. That is at least four times the number who arrived last year. Speaking in Nuremberg, Ms Merkel said failed asylum seekers must be sent back more systematically, and "on this we must be much stricter". She was referring especially to migrants from Western Balkan countries such as Kosovo and Albania, now considered safe by the German authorities. But an official German report leaked on Sunday recommends that the federal authorities also send back many more Afghans than previously. Only about half of the Afghans reaching Germany qualify for asylum, but few have been repatriated. The authorities are concerned because they are the biggest and fastest-growing group after Syrians. Slovenia's police said on Monday that nearly 10,000 migrants had arrived from Croatia in the past 24 hours. In total almost 75,000 have entered the tiny Alpine country in the past 12 days. The United Nations has welcomed an agreement between European Union and Balkan leaders to control the flow of migrants heading for northern Europe. The heads of 11 EU states and three non-EU countries agreed to provide another 100,000 spaces in refugee reception centres. But the EU neighbours in Central Europe and the Balkans have exchanged angry accusations in the current crisis. The UN High Commission for Refugees says 157,000 migrants have arrived in Greece so far this month - more than in any month this year. The European Commission is offering additional aid to Greece to deal with the crisis.